Hathaway Brown's signature Institute for 21st Century Education is proud to present Food for Thought Fridays, a casual lunchtime lecture series that's open to all members of the community. Celebrating its inaugural season during the second semester of the 2018-2019 school year, this program is a terrific way for students, faculty, parents, alumnae, and friends of the school to hear a wide array of viewpoints as dynamic presenters share their expertise in a variety of disciplines. Thirteen separate programs will be offered in 2019. Be sure to check this page often, as the roster is being continuously updated. All presentations will take place in the Worldwide Communications Center, with drop-in attendance from 12:30-1:30 p.m. No reservations are required—come to any session that interests you. Although lunch will not be provided, students and faculty members are welcome to stop at the Dining Hall ahead of time and bring their lunches to the program. Through a special arrangement with the HathCaff, HB's student-run cafe, we're also offering an incentive program for attendees. When you join us for your first program, you'll receive a special Food for Thought punch card. Once you've attended three sessions, you can redeem the punch card for an item of your choice at the HathCaff! We plan to continue this programming in the fall and in subsequent school years. 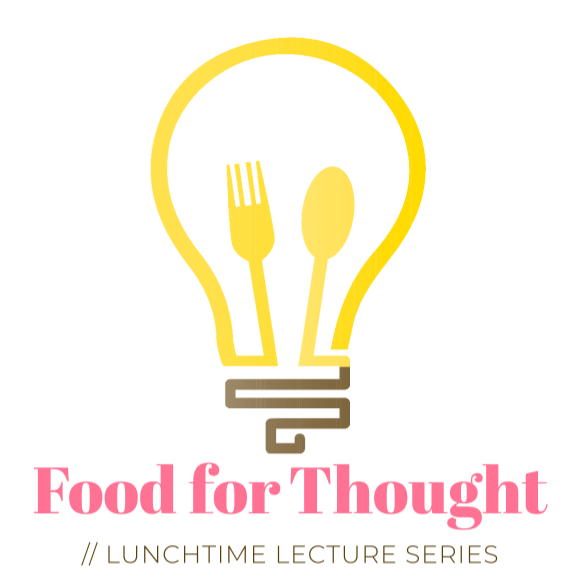 If you'd like to be a presenter at an upcoming Food for Thought session, please email program coordinator Molly Krist at mkrist@hb.edu.